Kenyan runners once again dominated, with defending champion Patrick Makau retaining his title in front of 9,044 participants from 42 nations. Warm weather, reaching 25°C at the finish, prevented either Makau or women's winner Flomena Chepchirchir from threatening the course records. The men's race set off at record pace but had drifted away from it by 10km. "It was simply too warm today for a record chase", Makau said later. He decisively broke away at 17km to set this year's world leading time at the distance. Makau remains unbeaten in Berlin: after last year's 25km race he had also won the Berlin Half Marathon a month ago. Flomena Chepchirchir sprung a surprise on the race favourite Peninah Arusei. Chepchirchir broke away from Arusei with 5km to go. "I did not expect to be able to beat Peninah in this race since she had beaten me only a week ago in a 10km race", Chepchirchir said. Magdaline Chemjor (Kenya), who won in 2001 and 2002, came in third. Argentina's Claudia Camargo, now living in the United States, broke the women's record in placing an amazing third overall in the race. This was in itself another record and a rarity in marathons generally. Including a sub-2:40 time bonus Camargo won US$5500. In the men's event Thomas Omwenga beat two-time champion from 2005 and 2006, Kassahun Kabiso. Top finishers were awarded cash prizes totalling more than $25,000 from Mosaik MasterCard. In this 36th edition a total of 12,636 triumphant runners and walkers crossed the finish line in the full and half marathons, coming from 35 countries. Back in 1972, 72 runners completed five laps around Stanley Park. Today, the BMO Bank of Montreal Vancouver Marathon takes participants along a 42km route through all the most scenic parts of the city to the finish line at BC Place Stadium. President Vaclav Klaus was the official starter for nearly 4000 marathoners who took part in the 13th Volkswagen Prague Marathon although hotter than expected temperatures slowed times writes Monika Klementova. Initially a group of 15 set a 2:09 pace but the lead pack quickly started to break up, as Oleksandr Kuzin of Ukraine took the race through halfway in 1:05:10. By 30km Stephen Kibiwott was running solo in the lead, some 30 seconds ahead of Luka Chelimo and pre-race favourite Joseph Riri of Kenya (PB 2:06:49). But the heat eventually got to them as Kibiwott dropped out and Riri stopped at 36km. He did manage to re-start his race and ended up finishing in a brave fourth place. Of the three runners who passed him to contest the title, one was Chelimo and the other two were 33-year-olds from Portugal, Helder Ornelas (PB 2:09:59), the winner of the 2005 Milan Marathon, and Paulo Gomes (PB 2:15:56). Chelimo made the pace but at 40km Helder went past to claim victory while Chelimo was rewarded with a new personal best of 2:12:36 about 80m ahead of Gomes, who improved his best time by even more. Pavel Faschingbauer was the first Czech home and retained his national title. In the women's race defending race champion Alina Ivanova of Russia was one of many who was forced to drop out due to hot weather, as her compatriot Nailya Yulamanova went on to win. Veronika Brychcinova took the Czech national title in third place overall. A total of 3200 runners finished within the six-hour time limit. Both the marathon and the half marathon started at the same time, but in two different places: Pontedera (marathon) and Navacchio (half marathon) which is located at halfway on the marathon course. 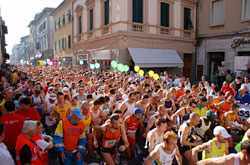 More than 1000 runners passed through Pontedera, Calcinaia, Vicopisano - with its ancient Borgo and the Brunelleschi Towers, Cascina, Calci - with its ancient cloister, San Giuliano Terme, and along the Mediceo Aqueduct. The finish line was in Piazza dei Miracoli, where the Leaning Tower stands. This 9th edition drew a great number of tourists who profited from low-cost flights connecting Pisa to many European cities. The temperature was 26-28°C but the water stations every 2.5km allowed runners to complete the marathon without distress. 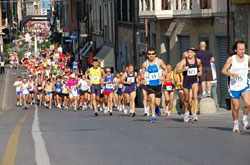 Female participation, at 13%, is the highest of any Italian Marathon. 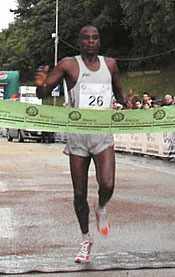 The winner, Philemon Kipkering Metto, also won from 2000 to 2003. 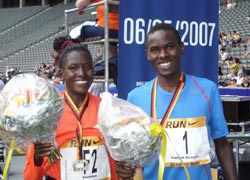 He ran side by side with the winner of the last two years, Joshua Kipchumba Rop, and with Filali Tayeb from Algeria. At 32km Kipkering speeded up but still finished the marathon with a time far slower than his best for the race (2:15:29). The women's winner, Ilaria Bianchi from Pisa, set off very fast in the first part of the marathon. She looked set for a new personal record of around 2:36, but faded in the second half and finished with a time of 2:40:11 – still an event record. For most of the race Daniel Rotich played a waiting game within a big pack, but on the last of four laps, as the group closed on early leader Felix Ntirenganya he powered away for a clear win. In the women's race Prisca Kiprono likewise saved her efforts for a strong last lap but by that time had only Caroline Chemwolo for company. Rotich ran each lap faster than the previous one, made easier by a 26-strong group recording a lethargic 37:13 for the first, while Ntirenganya was away by almost 500m. On the second lap Ntirenganya accelerated, and continued to go away from the gradually diminishing group, which numbered 14 at the halfway mark (1:12:02 to Ntirenganya's 1:10:11). The group maintained the chase with a steady third lap as Ntirengenya started to slow. He led a group of 12 by 42 seconds as they entered the last lap, but then faded to finish a tired 14th. Prisca Kiprono had no early leader to chase, and the lead group reduced from eight to four as they went through halfway in 1:27:29. The third lap was by far the fastest, but Caroline Chemwolo hung on. The effort cost her, as she slipped back to finish third. In the half marathon a group of 25 men pounded around the first lap in 32:44, swallowing up the 155 marathon runners who had set off four minutes earlier. Dickson Marwa proved strongest on the second lap, coming home 60m clear of his closest rival. In the women's race Josephine Deemay went away from the start, while local runer Epiphanie Nyirabarame pursued her a little too keenly, allowing Cecilia Wangoi - running a steady pace throughout and closing on Deemay herself in the later stages - to come through for second. The competitive races were supportd by a 5km fun run which incorporated a highly competitive AIMS Children's race for 10-11 year olds. In all 2200 people registered for all races, of which 1200 were in the Children's event. All races started and finished in the national stadium, and runners in the longer races passed through it as they completed each 10,549m lap. The lap itself included an out-and back section which featured a significant hill, one of many in this "land of a thousand hills", and made all the more difficult by being at 1800m altitude. A record number of over 1100 runners from 40 countries participated in the eighth annual Great Wall Marathon, with the field split between the marathon, half marathon, 10km and 5km events. Race records were set in the marathon. Salvador Calvo, of Spain, shaved two minutes off the men's record with a time of 3:23:10 while Sara Winter, of New Zealand, took 22 minutes off the women's record, leaving the new mark at 3:50:21. It is always interesting to see how times compare on a "normal" marathon course to the Great Wall and this year's winners give a good indication. Calvo, 44 years of age, set his best of 2:32 15 years ago while Winter ran a 2:46 marathon just four weeks earlier in Italy. Fred Zalokar, of the USA, won the M45 division of last year's Canberra Marathon in 2:45:58 and this year was second at the Great Wall in 3:38:14. 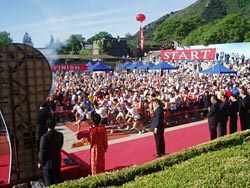 There is no doubt that the Great Wall Marathon is one of the most international of races with 11 countries represented in the top 10 men and women in the marathon. 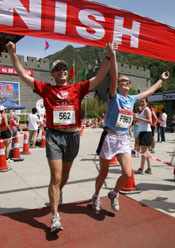 Regardless of which event runners opt, they face a 3km section of the Great Wall. Those in the marathon run this section twice, once from east to west early in the race and again late in the race, but this time they run the Wall from west to east. In between sections on the Wall, marathon runners traverse a 25km section through Chinese villages that have hardly changed in centuries. One high profile runner who is unlikely to return to the Wall is dual world champion and London Marathon winner Abel Anton. He retired from the serious side of the sport five years ago but was tempted by the Wall this year. He was 20th in 4:26:07 and said later to AP journalist Stephen Wade, "I don't think I will be back again, I think once is enough. It's very hard, maybe the hardest I have done." Conditions were excellent for the 17th edition of the race, and offered the opportunity to set personal best times. In pleasant temperatures and no wind 2095 runners set off, quickly headed up by a lead men's group of Kenyans, Ethiopians, Tanzanians and Moroccans. Passing 5km in 15:11, the race thereafter became a contest between Peter Korir and Alex Kirui, who passed through 10km together in 30:10 and 15km in 44:10, speeding up as they struggled to capture the victory. 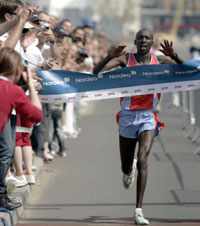 Peter Korir was the one who did so, in a new course record. In the women's race defending champion Joan Ayabei went straight into the lead with an unbeatable pace that carried her further and further away from the opposition. She romped home to beat the old course record by more than 90 seconds. Over a thousand runners (of 1300 entrants) completed one of the three events on offer, which also included a 5.3km fun run. 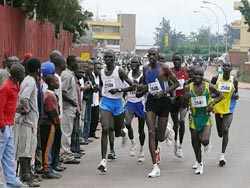 Of these 180 were marathon runners and 58 were foreign runners, representing 21 countries. 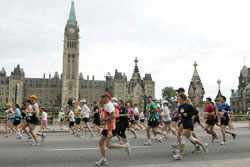 A record number of more than 29,000 runners from 47 countries took part in the various events of Ottawa Race Weekend, with exciting races in both the 10K and the Marathon writes Alan Brookes. On a sunny, warm (25°C) Saturday evening, Canada's Simon Bairu thrilled the local crowds with an impressive victory as he out-sprinted Ethiopian Chala Lemi and Kenyan Linus Maiyo, after being 15m down at 9km and seemingly out of contention (28:29 to 28:33 and 28:48). Bairu also picked up an extra $5,000 for winning the "Battle of the sexes" over women's winner Catherine Ndereba (33:01). The women were given a 3 minute 51 second advanced start. Ndereba had an easier time of things in the women's race, finishing 150m ahead of Florence Jepkoskei, and 450m ahead of third place Aster Demissie, an Ethiopian national living in Edmonton, but she was unable to hold off the 23-year-old Bairu in the male-female contest. Sunday morning dawned cooler (12-17°C over the race period), and overcast. In such excellent conditions, the marathon got off to a quick start with pacesetters taking a lead pack of 15 through 5km in 15:08, 10km in 30:20, and 21km (not halfway) in 1:04:24. The first half of the course took the runners across the wide Ottawa River into Gatineau Quebec, then along leafy tree-lined roads through scenic neigbourhoods before returning to the Ottawa side. The terrain was rolling terrain and there were lots of turns. Last year's winner, Abderrahime Bouramdane, and dozen Kenyans headed the field for a "Bouramdane vs East Africa" showdown over the flatter, second half of the race - out-and-back along both sides of the Rideau Canal. After 28km the pace gradually slipped, from 3:05/km to 3:10/km. By 30km (1:32:15), the group was down to Bouramdane and seven Kenyans. The last pacemaker then fell back, and the pace slipped further to 3:15/km. None of the Kenyans seemed prepared to make a move, and it was left to the Moroccan to force the issue. He ran 3:02 for the 37th kilometre and then had only the youthful Vincent Kiplagat (22 years) and the wily David Cheruiyot (2005 champion in Ottawa and Houston) for company. 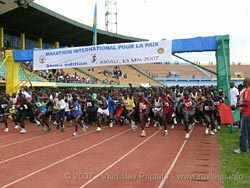 In the end the courageous Bouramdane was unable to shake off his final two rivals and the veteran 36-year old Cheruiyot defeated him in another thrilling sprint down the home straight, to break the course record by 72 seconds. Hometown fans were further cheered as the rain began to fall, with the convincing victory of Canada's Lioudmila Kortchaguina who ran the entire second half on her own. The two Ethiopians who followed her home ran together most of the way. Everybody hopes that there will not be as much rain next time writes Alberto Zorzi. This championship race was a test event for the IAAF World Road Running Championships to be held on 14 October. "It was the kind of weather conditions organisers hope never to have," said the head of the Local Organising Committee, Paolo Bordon. In heavy rain, Kenya's Solomon Rotich and Bahrain's Nadia Ejjafini won their respective races, while Giuliano Battocletti and Anna Incerti took the national titles. Olympic marathon champion Stefano Baldini's poor form confirmed and in the next few days he will announce whether or not he plans to compete at August's World Championships in Osaka. The 7km lap in the city centre is completely flat, apart from a slightly uphill stretch in the first kilometre and a downhill one to enter the "Piazza I Maggio", where the start and finish are is located. The athletes repeat the lap three times plus a straight at the beginning to reach the distance of 21.097km. It will be the second time Italy hosts the Championships after the 1999 edition held in Palermo and won by Kenyans Paul Tergat and Tegla Loroupe. The LOC hopes to have such star winners also this year. 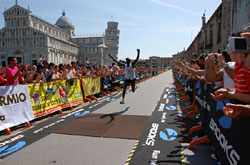 In recent days World record holder Samuel Wanjiru has indicated his interest in running in Udine. He would like to add a gold medal to his astonishing times over the distance. Giuliano Battocletti led the race from the beginning at a 3:00/km pace (14:56 at 5km, 29:55 at 10km). A pack of eight reached 15km (44:59), where the Italian launched the first serious attack. Only Kenya's Rotich, Philemon Kipkering and David Ngeny Cheruiyot were able to follow him, while Baldini began losing ground. With the national title in his pocket, Battocletti did not follow Rotich and Kipkering when they upped the pace at 17km. Rotich, 23, made another strong move in the last kilometre to drop Kipkering. Moroccan-born Ejjafini, who now runs for Bahrain and lives most of the time in Italy, repeated last year's win with a solo run from the outset. At three kilometres she ran a split of 3:11 and nobody tried to follow. At the end of the second lap she was on pace for a sub-1:11 run, a very good time considering the weather, but she slowed in the last kilometre. Anna Incerti and Morocco-born Fatna Maraoui staged a great battle for the national title. They ran shoulder-to-shoulder for 18km before Maraoui took a 20m advantage on Incerti. The Sicilian athlete closed the gap in the following kilometre and immediately launched her own attack. Incerti, who at one point was 44 seconds behind the winner, finished just 24 seconds after Ejjafini. A mother-of-five and a former heart patient stole the show in yesterday's fifth Edinburgh Marathon write Lorin McDougall, Steven Raeburn and Richard Moore for Newspaper. Fiona Matheson, 46, has a handful of teenage kids, including twins, and was a latecomer to the sport. In the men's race ex-1500m runner Ian Grime completed a fairytale return from heart surgery to win in a sprint finish. The wet and windy conditions slowed times despite a helpful 70m drop from the start on Princes Street to the finish at Musselburgh Racecourse. The new course won praise - even if the weather was hardly conducive to fast times. Without cash incentives to lure the all-conquering Kenyans, who have won for the last three years, a different set of standards applied. "I just went along with the kids to Grangemouth Stadium and I heard about jogscotland there" said Matheson. "Before I knew it, I was running a mile and the next thing was doing a 10km. I found that running was something I really enjoyed. I always fancied doing the Edinburgh Marathon, and I loved it. It was a good course and if the wind hadn't been at you then it would've been faster. I didn't know that I was pushed so close - I didn't look round at any time during the race." Just 18 months ago, Ian Grime couldn't even run around the block. A heart condition had forced him into surgery, but the 36-year-old rehabilitated himself by sprinting home to win his first marathon. "I'm not pleased with the time; I'd hoped for about 2:25 - but I'm pleased with the win", he said. Grime was forced to stop running when he was diagnosed four years ago with an atrial fibrillation, a condition normally affecting those over 65. Prior to surgery, his heart would pound excessively, causing chest pains, breathlessness and dizziness. "I couldn't run and my heart rate got high when I trained," he recalled. "It's good to come back to a bit of form after 18 months." Heavy rains pounded the 7,500 runners registered for the event - including about 5,000 for the full marathon - as they set off from Princes Street in the city centre, but the sun had emerged by the time the leaders were welcomed by an enthusiastic crowd at Musselburgh Racecourse. Sharing the lead with Wayne Lincoln after 30km, Grime triumphed with a powerful sprint finish. "It was tough on the way out because it was so windy. It was hard work. On the way back, the wind was behind us" he said. Participants included a relay team of four runners with a combined age of more than 300, who ran to raise money for the Sikhs in England charitable trust.